Just 350 feet from Amoudara Beach, Uncle George Studios & Apartments offers self-catered accommodations and free Wi-Fi in public areas. Set amid bougainvillea trees, it features an outdoor restaurant serving Greek dishes and local delicacies. 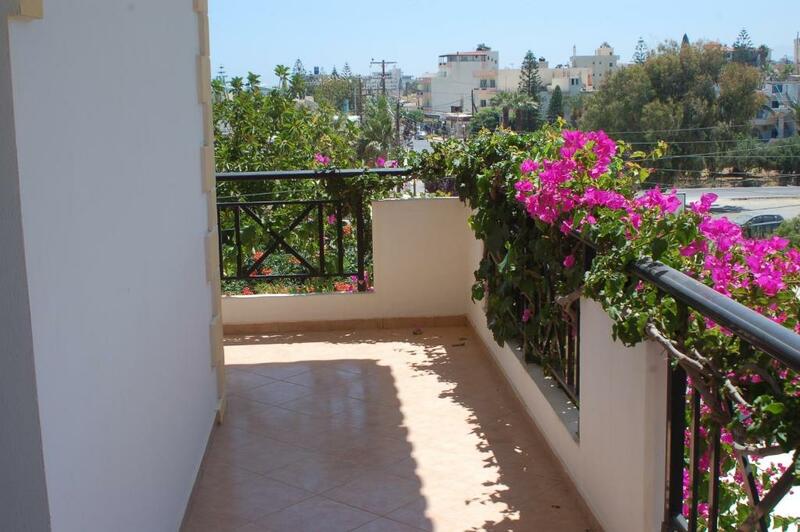 Opening to a balcony, all studios and apartments have a kitchenette with cooking hobs and a fridge. Fitted with tiled floors, each is spacious and comes equipped with a TV. Some enjoy Cretan Sea views. Guests have free access to a swimming pool and snack bar at the sister property of Uncle George Studios & Apartments, few feet away. The property is located 3.7 mi from the center of Heraklio City and 5 mi from Nikos Kazantzakis International Airport. Free parking is possible nearby. When would you like to stay at Uncle George Studios & Apartments? Opening to a balcony, this studio features a kitchenette with cooking hobs and a fridge, as well as a TV. Some enjoy Cretan Sea views. Opening to a balcony, this apartment features a kitchenette with cooking hobs and a fridge, as well as a TV. Some enjoy Cretan Sea views. House Rules Uncle George Studios & Apartments takes special requests – add in the next step! Uncle George Studios &amp; Apartments accepts these cards and reserves the right to temporarily hold an amount prior to arrival. Uncle George Studios & Apartments accepts these cards and reserves the right to temporarily hold an amount prior to arrival. Please inform Uncle George Studios & Apartments of your expected arrival time in advance. You can use the Special Requests box when booking, or contact the property directly using the contact details in your confirmation. We were there for just one night so had a downstairs room which was adequate. The worst hostess. Makes you feel like you´re not welcome. Tried to move me to a smaller and much more noisy room. Said openly that she'd prefer if i would check out before the 3 nights were over. Removes the pillows and bed-sheets from my exstra beds. The day of check-out she knocks on my door to ask if i'll soon leave the room. A little bit noisy from the street in the evening. All was paid in advance, but at the reception they said it was not. We had to call Booking.com support to get the problem fixed. It was an unpleasant holiday start. Went with 26 year-old son. He would have liked toaster and oven (hob, fridge and sink) Kitchen basic but adequate. We made reservation online with credit card. During departure hotel staff told us that they need our credit card to finalize transaction, as a result we paid twice for our reservation. Avoid this place. I was charged for my booking twice - online and on site. Up to now booking.com is not able to solve this problem altough I provided documentation of all transactions. I strongly reccomend you to avoid making any booking with your credit card.